When James Hanlon bought an Atlantic Lottery’s Set For Life instant ticket, he had no idea how much it would mean to his finances. And when he managed to match three ‘set for life’ symbols, he was not even sure how much money that meant – until the clerk told him. 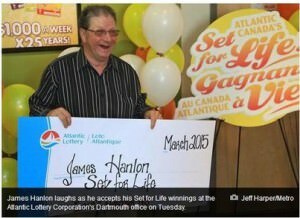 Hanlon won the second of four grand prizes in the game – good for $1000 a week for 25 years, or a $675,000 lump sum payment. He quickly chose the lump sum and announced his immediate plans for the money: buy a new car and a set of false teeth. He also plans to gift two children $50,000 each. However, Hanlon does not plan to retire from his work as a handyman anytime soon.